Chinese input methods and fonts can be easily installed on an English-language Ubuntu system, or any other non-Chinese Ubuntu system. 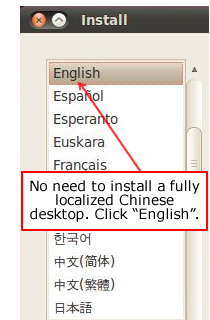 You do not need to install a localized Chinese desktop. You should not need to do anything on the command line, although I will introduce a few possible tweaks and fixes later in this discussion. During installation, just click "English" or any other language you prefer for your main interface when presented with localization choices, as shown here on the left. 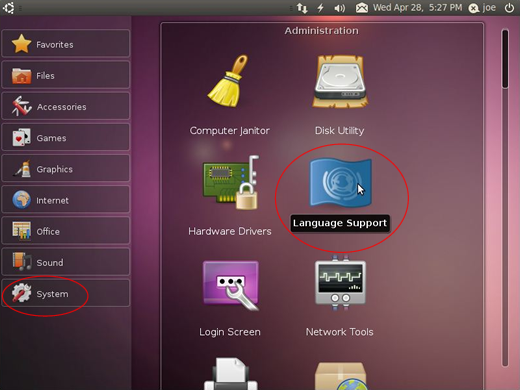 As you can see from the list shown here, is possible to install Ubuntu 10 as a localized system with most of the GNOME menus and dialogs in simplified or traditional Chinese, but this is not necessary. You can get Chinese features working in any language interface including English. I'm not going to provide full installation instructions, as this is a simple wizard-based process that is well-supported on the main Ubuntu website and other forums. My next step picks up after installation and updating are complete. In the following steps, Ubuntu will need to download many files for Chinese support. Please make sure you are connected to the Internet before proceeding. 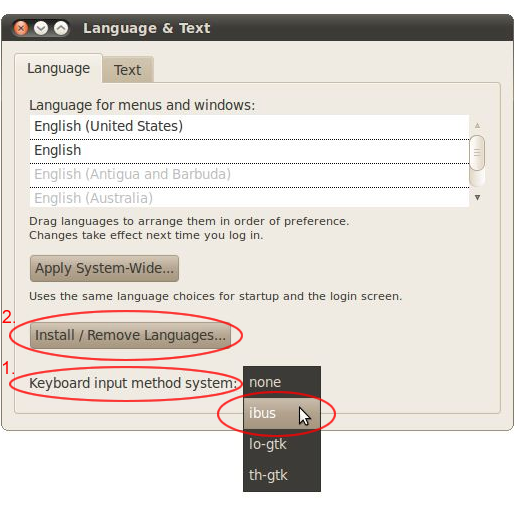 If you are using Ubuntu Netbook 10.04 click "System" and then click the "Language Support" icon. 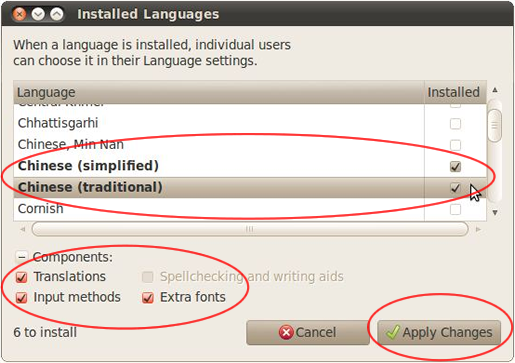 In the new Ubuntu Netbook 10.10 Unity interface, on the right click "Applications", then up top click "System", then click the "Language Support" icon. After you click "Language Support" you may immediately be asked to update a language you already have installed, such as OpenOffice.org hyphenation for English. That won't take long, so go right ahead and let that install while you are connected to the Internet. click the button that says "Install / Remove Languages..."
"Installed Languages" will appear. Scroll down to "Chinese (simplified)" and "Chinese (traditional"), and click their boxes in the "Installed" column as shown below. (Also go ahead and try the "Chinese, Min Nan" option if you dare! Don't know know enough Taiwanese for that one myself.) Usually you will want to leave all of the "Components" boxes checked as well. Click the "Apply Changes" button. Enter your administrator password if required, and the system will download and install a big package of Chinese fonts and other resources for both Ubuntu and OpenOffice, including a Pinyin database or two. In 10.04 I got a dialog box saying "Changes applied", and I had to click the "Close" button. In 10.10 it went back to Language & Text all by itself. In the middle of "Language & Text", there is some very small but very important fine print: "Changes take effect next time you log in." Close Language & Text, and then log out as shown here.